Clay v. United States, 403 U.S. 698 (1971), was boxer Muhammad Ali's appeal of his conviction for refusing to report for induction into the United States military forces during the Vietnam War. His local draft board had rejected his application for conscientious objector classification. In a unanimous 8-0 ruling, the United States Supreme Court reversed the Fifth Circuit court's affirmation of the conviction. The Supreme Court of the United States found that Ali's conscientious objector status was valid, notwithstanding the government's argument that it was based upon politics and racial considerations. 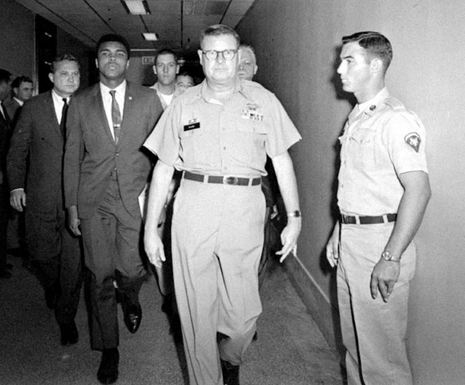 Muhammad Ali appealed his local draft board's rejection of his application for conscientious objector classification. The Justice Department, in response to the State Appeal Board's referral for an advisory recommendation, concluded, contrary to a hearing officer's recommendation, that Ali's claim should be denied, and wrote that board that Ali did not meet any of the three basic tests for conscientious objector status. The Appeal Board then denied Ali's claim, but without stating its reasons. Ali refused to report for induction, for which he was thereafter tried and convicted. In this Court the Government has rightly conceded the invalidity of two of the grounds for denial of petitioner's claim given in its letter to the Appeal Board, but argues that there was factual support for the third ground. The Court held that, since the Appeal Board gave no reason for the denial of a conscientious objector exemption to petitioner, and it is impossible to determine on which of the three grounds offered in the Justice Department's letter that board relied, Ali's conviction must be reversed. However, this bold move also lit a fire under the growing anti-Vietnam movement in America. Again, the nation was torn when it came to Ali. He was eventually imprisoned for five years and stripped of all his titles for refusing reduction into the Army. However, on June 28, 1971 the U.S. Supreme Court unanimously reversed the conviction, saying that Ali's "beliefs are founded on tenets of the Muslim religion as he understands them." While he was reinstated into boxing upon the Supreme Court’s ruling, Ali was vilified by many Americans for his “draft-dodging” tactics. However, Ali persevered and sought to regain the titles which he felt were still his.